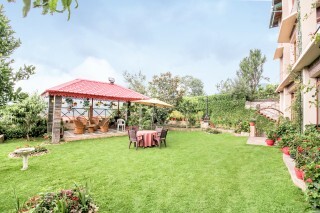 Located in the quaint town of Ramgarh, this is an offering of a private room in a bungalow, which can accommodate up to three people. 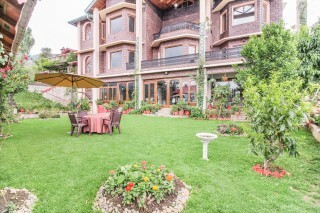 The property is fronted by a stunning view of the alpine landscape, and the room on offer is ideal for a couple. 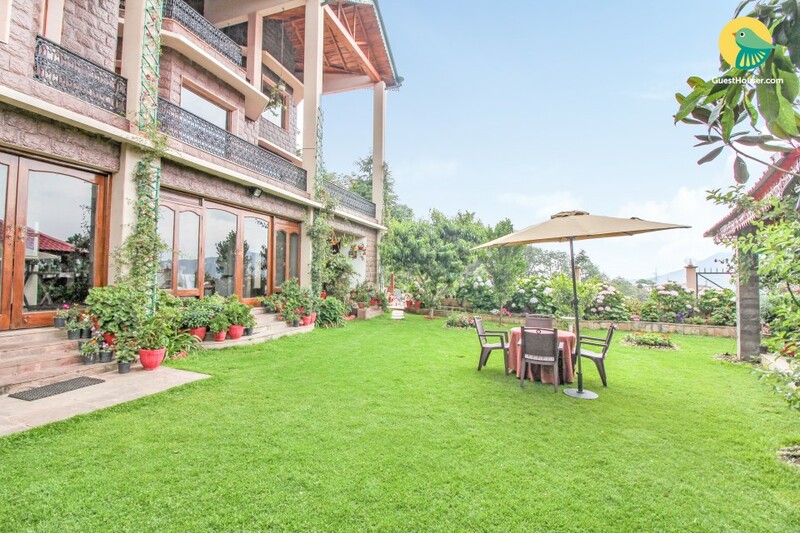 Your Space This luxurious bungalow looks out to a serene panorama, which makes the well-tended garden the perfect spot to pull up a chair and admire the view with a hot cuppa in hand! 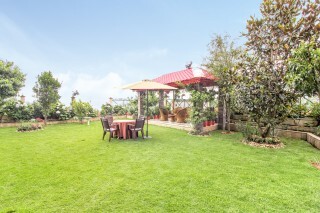 A gazebo sit-out and garden seating is provided for your convenience. The bungalow features a gable roof, tiled parapets, and exposed brick exteriors, which lend it a rather rustic charm. 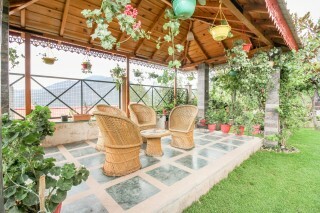 Inside, the interiors are decorated with authentic wall art and feature marble floor and exposed beam ceilings which add to the aesthetics of the bungalow. Round dining tables with comfortable seating is provided in the dining room to ensure all your meals are enjoyable. A flat-screen television is set up here for added convenience. The bungalow boasts a lounge in all three floors, where you can sit back on the plush sofas and get that much-needed reading done. The spaces open out to balconies so you can step out and soak in the refreshing air! 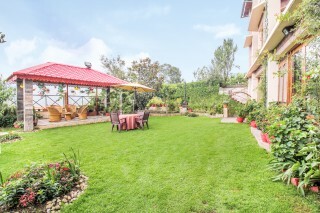 The bedrooms are each furnished with a fluffy double bed with side tables, a spacious wardrobe, a comfy three-seat sofa, a coffee table, a dresser, and a couple of storage cabinets. The en suite washrooms are tiled and well appointed with western sanitary ware. 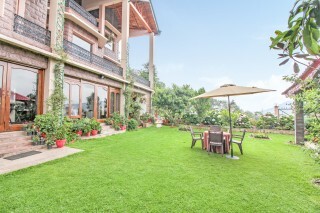 The majestic views (with the Himalayas as a backdrop) and the cool air makes it an ideal place for nature walks, bird watching, reading, painting or just practicing the fine art of chilling-out. The nearest station is at Kathgodam. There is a night train from Delhi (depart 11pm, arriving 6 am) and a taxi from the railhead to Ramgarh will be about Rs 800. The train to Delhi leaves Kathgodam at 8.40 pm, reaching Delhi at 5.15 am. Pantnagar Airport is 1 hr 36 mins via NH87.